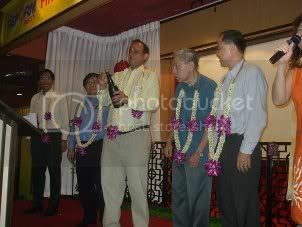 Kenneth Jeyaretnam spoke at RP's 1st Anniversary Dinner. Kenneth Jeyaretnam is the Secretary-General of the Reform Party (RP). He delivered this speech last night at RP’s 1st Anniversary Dinner. I would like to extend a warm welcome to you, on this the Reform Party’s First Anniversary Dinner. It is good to see so many people here tonight, diplomats from around the world and representatives of most of the active Opposition parties in Singapore but most importantly it is good to see Reform Party members, their families and all our supporters. And what a lot of you there are. You are the reason we are here today. Thank you. And it is one year since JBJ was interviewed by Hugo Restall of the Wall Street Journal. In that interview JBJ said he was often accused of talking too much about politics so now he was going to speak about economics. For my part, I speak too often of economics. I’m confident you all know by now that I am an economist. But I am also a politician, a politician who has the honour, the privilege, and the responsibility of leading Singapore’s brightest new Party, The Reform Party. So tonight, as is only right, I am going to speak about Politics. Recently we were given a history lesson in Parliament, by our Minister Mentor Mr Lee Kuan Yew, no less. We were told that in the US, despite the phrase from the Declaration of Independence that “all men were created equal”, it took till 1964 for the Voting Rights Act to be passed. This Act prevented the former slave-owning states in the US using a number of subterfuges to prevent black Americans from voting. It was then remarked that it took nearly another fifty years for America to elect its first Black President. But of course No-one in Parliament says any such thing. As any smart young nation would, we leapfrogged the technology bypassing the Penny Farthing and went straight to the MRT and LRT stages. We can make the same leaps with democratic processes. In any case, don’t be fooled. The lesson to be learnt from America is not the length of time it took for this to happen (even in 2007 who would have thought that a Black man with a Muslim name would become the next occupant of the White House) The lesson to be learnt is that this momentous event did not happen by magic. Instead there was a rising trend of registering Black voters resulting in increased Black participation in American political society and an increasing number of Blacks elected to both Federal and State legislatures and as Governors and Mayors. This culminated in record numbers of Black voters turning out in the presidential election of 2008, so that southern states that since at least the 1960s had always voted for a Republican candidate, suddenly turning Democrat and voted for Obama. So, Singaporeans, it won’t happen by magic. There is a process involved. If you desire a government that has at its heart a commitment to improve the lives of ordinary Singaporeans then you are the only people who can bring about those changes that put in place a chain of events that culminated in 2008 in the US with the election of Obama or this year in Japan with the victory of the Democratic Party, ending a virtually unbroken 55 year rule of the LDP. And it starts with Waking up! And then Signing up! As in America that process will begin with one person, then 10 then 100. Communism in Eastern Europe was finally put to rest when that first person climbed on the Berlin wall and started chipping away at it. I‘m not advocating mass disobedience, I’m reminding you that ultimately power resides in the people but if you are not prepared to climb on the wall in your mind and start chipping away at it then you will remain powerless. But it will not be easy. From every avenue The Government will tell you that there is no need to vote for the Opposition. In fact the Opposition is just a distraction. They have generously given us the NCMP and NMP schemes. Well let me tell you -The NMP scheme is a fundamental subversion of democratic principles that would be laughed at in any properly democratic country. Let me hear no more of NMP’s and their so called voices. Secondly it is ludicrous to equate NCMPs with NMPs when under our current GRC system 33% of those able to vote in the 2006 elections voted for Opposition candidates and yet the Opposition only won 2 out of the 84 seats in Parliament, which equates to 2.4% of the total. Let’s get that right- 33% of the votes resulting in 2.4 % of the seats. Enough of waiting 50 years! We need a government that will abolish the GRC system and go back to SMCs or move to a system of proportional representation where NCMPs would have the same powers as directly elected MPs. But how can you vote for a representative if there isn’t one to be found? It is compulsory to vote in Singapore, unlike in the US and yet for too many of you voting is a meaningless exercise. You are effectively disenfranchised because the Opposition has been unable to find sufficient candidates and financial resources to contest more than half of the constituencies. In 2006 the PAP were able to gain 37 seats on Nomination Day without having to contest them, because candidates could not be found to stand in these constituencies. This is a travesty of how the democratic process is supposed to work and for those of you living in those constituencies you might as well be living in North Korea or China, for all the ability you have to choose your representative. So not only do we need you to vote, we also need those among you with the necessary abilities and determination to come forward and become candidates. So I am upping the ante. And adding Stand Up! to Wake Up! and Sign up! So Wake Up! Sign Up! Stand Up! …………or at the very least buy a T-shirt! Thank you again for supporting us here tonight and we look forward to growing numbers of you coming forward to join us as we contest our first elections.